Musicologist Adrian Thomas considered Grażyna Bacewicz’s string quartets “unrivalled in 20th-century Polish music and… one of the century’s most significant contributions to the genre”. Her folk-music infused First Quartet dates from student days at the Paris Conservatoire, while exceptional polyphonic skill, intense emotion and playful, high spirits characterize the Third Quartet. Both the Sixth and Seventh Quartets unite tradition with a strikingly effective and highly personal exploration of progressive contemporary techniques. As Lutosławski observed, in the “rapidly changing artistic currents” of the times, “it was [Bacewicz’s] music which helped create that atmosphere”. Anyone who heard BBC Radio 3's recent 'Composer of the Week' profile of Grażyna Bacewicz will know that she is, from a Western viewpoint, the hidden gem of Polish 20th-century music. Though highly regarded in her native land, her music – sandwiched between Szymanowski on the one hand and Lutosławski, Panufnik and Penderecki on the other – has rarely gained the attention it deserves from international audiences. This new disc from Naxos should certainly help to redress the balance. Born in 1909 in the city of Łódź, Bacewicz was a child prodigy on the violin. She studied violin and composition at the Warsaw Conservatoire and, at Szymanowski's prompting, went on to study at the École Normale de Musique in Paris under the legendary Nadia Boulanger (composition) as well as André Touret and Carl Flesch (violin). In the earlier part of her career she was better known as a violinist, becoming leader of the Polish Radio Orchestra (1936–38) and a soloist in her own right. Even at this stage, she was already making her mark as a composer, but from the mid-1950s she devoted herself exclusively to composition. Her output is dominated by works for strings, including no fewer than seven violin concertos and seven string quartets. Bacewicz's earlier works reflect her training in Paris, and show a natural inclination towards a resilient form of neo-classicism, albeit with a strong lyrical bent and incorporating elements of folk music. Though she spent much of her life living under two totalitarian regimes – the Nazi occupation and post-war Soviet communism – her music retained a basically positive demeanour, quixotic and spiky but with an underlying strength and tenderness. Following the post-Stalin thaw, Bacewicz began exploring more modernist techniques, especially following her exposure to foreign influences at the first Warsaw Autumn festival of 1956. The works on this first instalment of quartets from Naxos span almost her entire career. The Quartet No.1 (1938) is a student piece, but a confident one whose vivacious neo-classicism rubs shoulders with folk music in the central movement, a set of variations on a Lithuanian folksong (Bacewicz's father, who encouraged her first musical steps, was Lithuanian). The Third Quartet (1947) was composed while on concert tour in Paris, and its airy textures seem to reflect the optimism of the immediate post-war period, above all in the high-spirited rondo finale. By way of contrast, the Sixth and Seventh Quartets (1960 and 1965) demonstrate Bacewicz's later incorporation of coloristic sound effects and even (in the first movement of the Sixth) twelve-tone serialism. Both are marked by a comprehensive and instinctive understanding of string techniques, and their sure feeling of structure and expressive involvement – as well as the absence of any hint of musical dogma – ensure that these are as engaging as any of her earlier works. 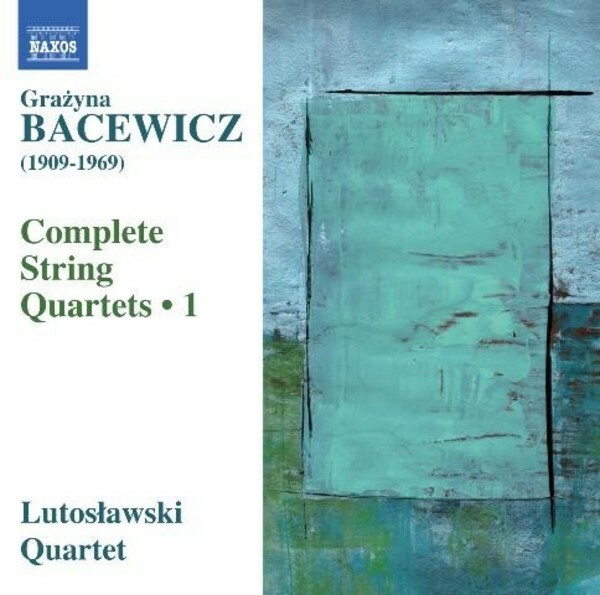 All four quartets are played with tremendous assurance by the Lutosławski Quartet, who are more than equal to Bacewicz's exacting technical demands. Here are musicians on a mission, presenting a hugely compelling case for these unduly neglected and fabulously rewarding works. Second instalment soon, please!